My kids LOVED making these Dinosaur Footprint Biscuits! Well the school holidays are here already in Queensland and although we are just a few days in, I’m already trying to come up with new ideas to keep the boys amused. 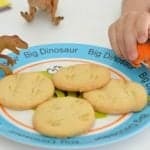 We made these Dinosaur Footprint Biscuits over the weekend after reading (AGAIN!) the book ‘Why Can’t I be a Dinosaur’ by Kylie Westaway, which was recently sent to us as a gift. My boys find this story hilarious and they love the idea of ‘dinosaur day’ and think that Nellie’s determination to wear her dinosaur costume to her Aunty’s wedding is a fabulous idea. ‘Why Can’t I be a Dinosaur’ is a fun story for the kids and our five year old was excited to be able to identify several ‘tricky words’ throughout the book and was super proud of himself for reading some of the sentences in the book out loud to myself and his brothers. Each time we read this book, it prompts the boys to pull out their entire collection of dinosaurs to play with (which I’m soooo excited about – not!) and it starts a conversation about which of their dinosaurs most resembles the dinosaur costume that Nellie in the book is wearing. 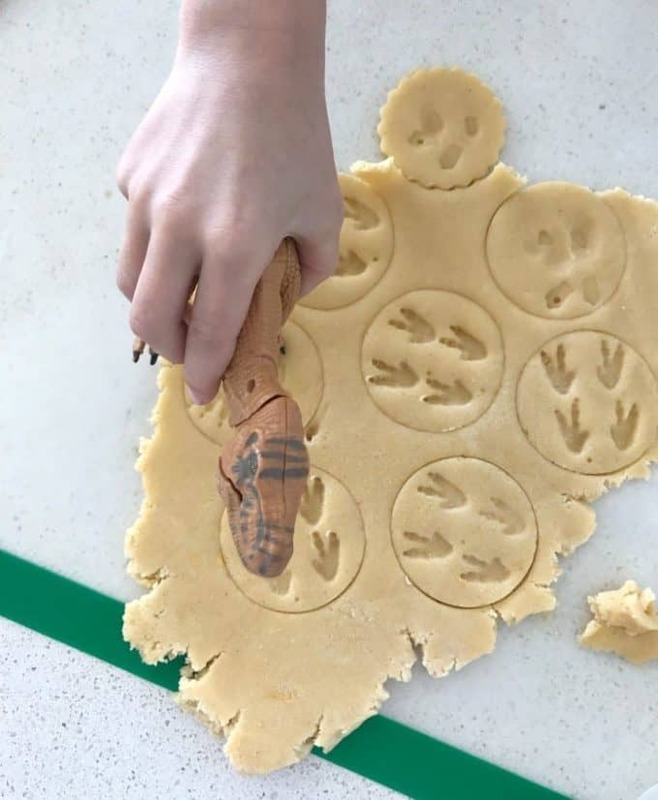 When I suggested that we use their dinosaurs to make these footprint biscuits, they were VERY excited and took the job of deciding which dinosaurs feet we were going to use VERY seriously. When making the footprints, it’s important to make sure your push down hard enough that they make an indent in the dough, as if you just lightly press the surface of the dough, the footprint won’t show up once the biscuits have baked. 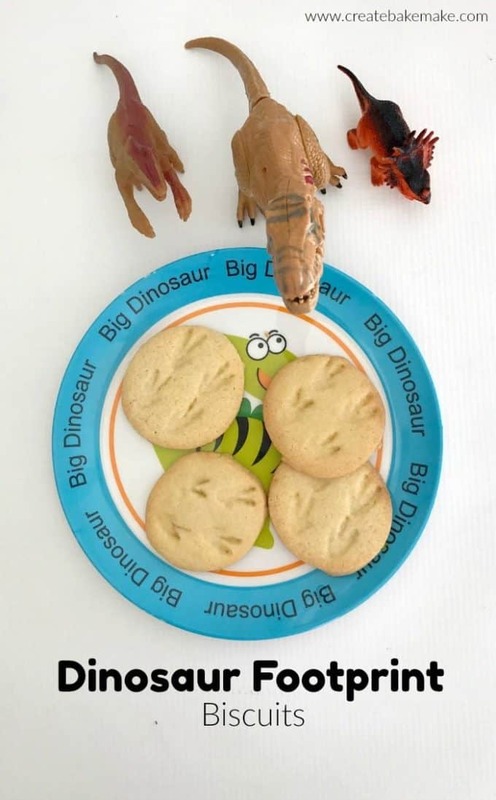 These Dinosaur Footprint Biscuits didn’t last for very long and already the boys are requesting we make more of them and they have also come up with some ideas of other things they can use to make imprints in the biscuit dough – what have I started!!!?!?! 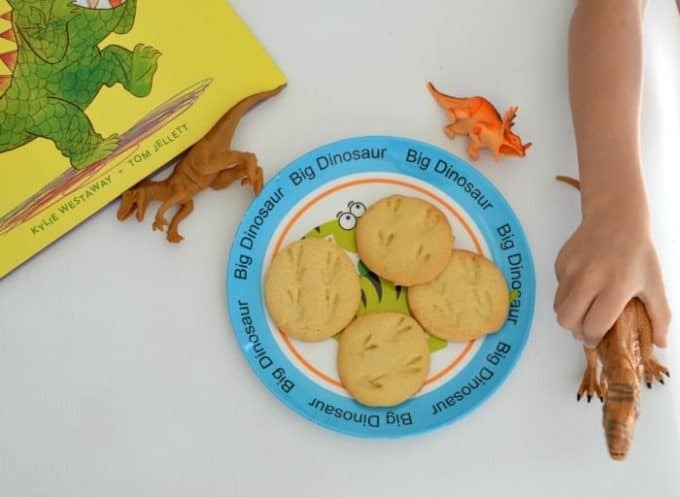 These Dinosaur Footprint Biscuits will be a hit with the kids! They are simple and fun to make and they are also freezer friendly too. Thermomix instructions also included. A dinosaur to make footprints with! Preheat your oven to 180 degrees and line two trays with baking paper. Place the butter, sugar and vanilla into the bowl of an electric mixer and beat for approximately 5 minutes or until light and fluffy. Add the flour, egg and extra egg yolk and beat together to form a smooth dough. Transfer the dough to a lightly floured bench and lightly knead before wrapping it in cling wrap and popping into the fridge for 30 minutes. Roll out dough (to a thickness of approximately 5mm) between two sheets of baking paper and use a 8cm round cutter to cut out the biscuits and place onto the prepared baking trays. 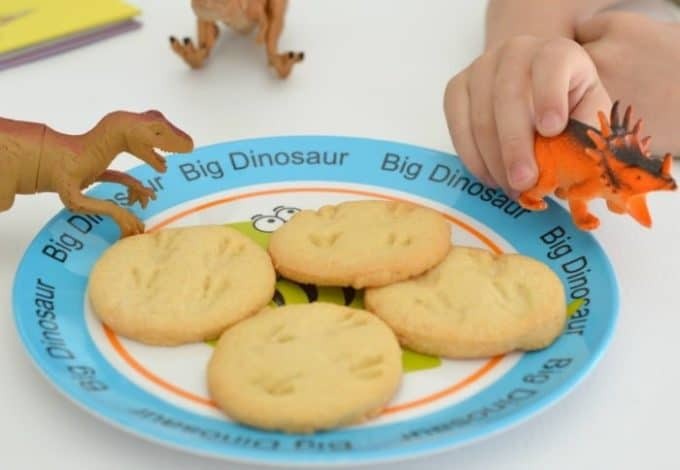 Carefully press your dinosaur into the biscuits to create the footprints and repeat until all of the dough has been used. Bake for 12 - 14 minutes or until golden. Allow the biscuits to cool on the trays for 10 minutes before carefully transferring to a wire rack to cool completely. This recipe makes approximately 30 biscuits, however this may vary depending on the size of the biscuit cutter you use. The cooking time will also vary depending on the size of the biscuits. Place the butter, caster sugar and vanilla extract into your Thermomix bowl and mix for 1 minute, speed 3. Scrape down the sides and mix for a further 30 seconds, speed 4 or until smooth and creamy – this may take longer depending on the temperature of your butter. Add the flour, egg and extra egg yolk and mix for 10 seconds on speed 4 before kneading for 2 minutes. Remove the dough from your Thermomix bowl and wrap it in cling wrap and pop in the fridge for 30 minutes. Bake for 12 – 14 minutes or until golden. Allow the biscuits to cool on the trays for 10 minutes before carefully transferring to a wire rack to cool completely. This book was kindly gifted to us to read and enjoy. All opinions are my own (and the boys!) and I was not paid for this review. You can learn more about this book and purchase a copy here. Hey! This is something interesting! Kids truly loved the biscuits and it made me remember those days of innocence. Thanks for sharing the recipe! Simple and delicious! It really made my day!